The theme for this week’s WordPress Weekly Photo Challenge is ‘Signs’. That’s lucky, because I have the perfect picture! I spotted this sign outside the toilets in a restaurant in Ferragudo, Algarve. It made me chuckle so of course I just had to take a photograph! Are women always ‘right’ or do men just let them think they are? Let the poll reveal the truth! It made, me chuckle. The restaurant is owned by an English couple. Should have added, love the sign – I am guessing the man who wrote it is not at all bitter. Hi tina…yeap the sign’s spot on! 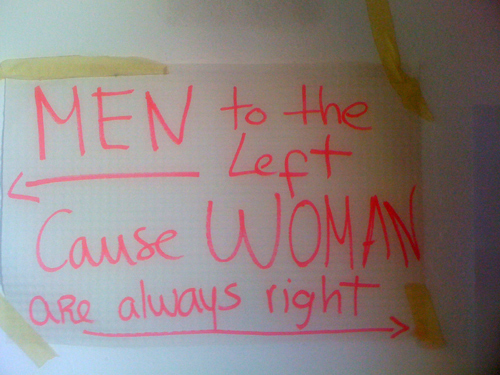 Love the sign too, and I do believe women as mostly always right! They have better intuition! Glad to know they have figured it out. Women are right!